In today’s digital world, it has become trends that every website should not only offer great functionality and “User Experience”, but also possesses alluring design. The pleasing design insists user to be more enthusiastic, while engaging with the websites. Nowadays, with presence of lots of websites, it is not easy for any business to stave off the competition and bringing new audiences. But, good layout might bring the customers. That can only be achieved with PSD to HTML conversion. PSD, as we all know, is the Photoshop design that allows designer to land the creative ideas. HTML is backbone of the website. That codes the website content and demonstrates contents on the internet. 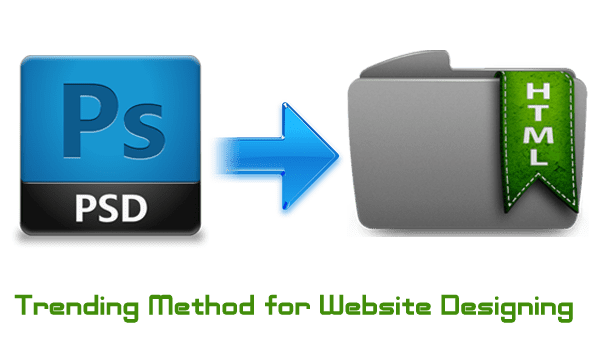 Converting PSD to HTML CSS has opened up lots of options for designers/developers/webmasters to present the website with not only effective layout, but also the functional-rich site. Hence, PSD conversion has become the trendiest methodologies for deploying website. Well Structured Architecture: Converting PSD to HTML allows developers to give clean architecture and helps in adopting W3C standard. Pixel-perfect Design: PSD to HTML gives the pixel-perfect layout to the website. SEO-Friendly: PSD to HTML Conversion makes content search engine friendly and, hence brings more customers to the site. Responsive Layout: The advents of Smartphones, tablet has made this necessary that the sites should also work on smartphone and tablet. Hence, responsive layout will surely help webmaster to gain access from the mobile users too. Optimize time & cost: PSD to HTML conversion also saves time and cost of the website project. Photoshop Design to HTML conversion is the trendiest solution for the website designing to gain the audience attention towards the business. On the ground of beneficial aspect, it will surely rule the website development methodologies. Hope, that you are now aware about how PSD to HTML be the best technique. If you have any idea to share, regarding this blog, you can share through the comment section given below.